For the second time in a week, the discovery of an anomalous superluminous supernova has challenged ideas about how some of the largest explosions in the universe occur. In fact, this new superluminous supernova, the closest ever detected, is in a galaxy with far higher metal content than was thought capable of creating events like these. Around fifty supernovae have been seen that are 10-100 times brighter than regular star-ending explosions. They’ve been dubbed superluminous supernovas or hypernovas. All have been at enormous distances, restricting our capacity to establish their sources. On May 23 the supernova SN 2017egm was spotted, and the closer astronomers looked, the more unusual the event turned out to be. For one thing, SN 2017egm is the closest superluminous supernova we have yet seen. At 420 million light-years away it is hardly close by the standards most of us are used to, but cosmologists operate on a different scale. Since the next closest event of this size was three times further away, its location is surprising. Moreover, according to a paper to be published in the Astrophysical Journal (preprint available on arXiv.org) SN 2017egm’s galaxy, NGC 3191, doesn’t fit the normal pattern. Most superluminous supernovas are in dwarf galaxies. It’s thought this is because they can only occur in environments with very low concentrations of elements heavier than helium, which astronomers call metals, even those like carbon and oxygen that chemists would not consider metallic. High metal stars powerful enough to produce explosions this size throw off a lot of their mass beforehand, reducing the ultimate size of the explosion. Just last week the superluminous supernova DES15E2mlf posed a challenge to this theory when it was revealed that it occurred in a galaxy that, while smaller than our own, was still no dwarf. However, this was explained with the theory that DES15E2mlf occurred so early in the universe that a galaxy of this size had yet to build up a high metal concentration. SN 2017egm is even more problematic, however. NGC 3191 is a fair sized spiral galaxy and the explosion occurred when the universe was 97 percent of its current age, so it is hardly likely NGC 3191 was insufficiently evolved. When Dr Matt Nicholl of the Harvard-Smithsonian Center for Astrophysics looked more closely, he confirmed that NGC 3191 is a little smaller, but actually richer in metals, than the Milky Way, deepening the puzzle about how it could produce such an explosion. Co-author Professor Edo Berger pointed out that even if such an event can occur in our galaxy, They’re so rare that we probably have to wait several million years to see one.” If we did, however, they would be truly spectacular even one in a distant part of the galaxy could outshine the full Moon. Our relatively close-up view on SN 2017egm has increased Nicholl and Berger’s confidence in the theory that superluminous supernovas result from magnetars, fast spinning, highly magnetized neutron stars. The event also puts some past superluminous supernova in a new light. A couple of these have been observed at the outer edges of galaxies known to be relatively metal rich on average. Astronomers assumed metals were scarcer at the edges, avoiding the need to question the idea that metal scarcity is essential for superluminous status. 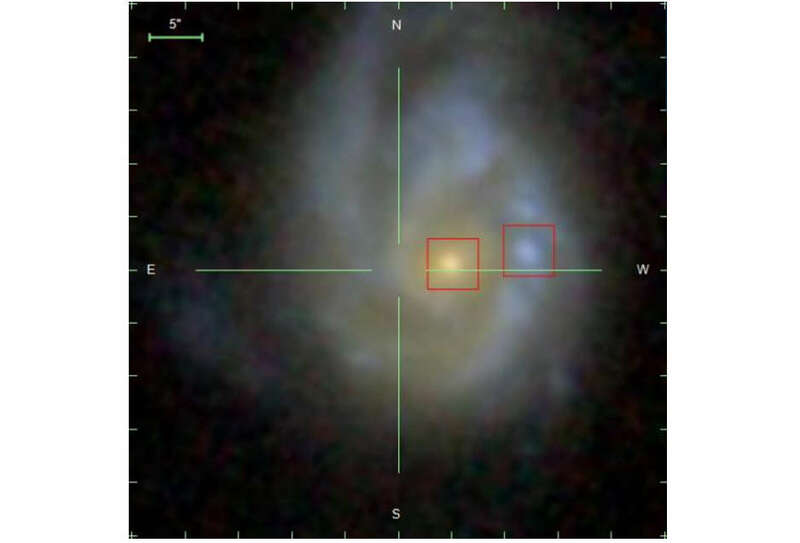 SN 2917egm is in a fairly typical part of NGC 3191, and comparable areas show metal concentrations higher than the Sun’s raising the possibility the previous events were in similarly metal-rich environments. Looked at this way, superluminous supernovas resemble long gamma ray bursts, about 10 percent of which occur in metal-rich environments, although explaining just how this occurs needs a lot of work. Astronomers learn a lot from watching the slow declines of supernovas, but frustratingly, SN 2017egm will be blocked by the Sun from early July to mid-September. Nevertheless, the team intends to be watching as soon as they can see it again, and think it may stay visible for a record-breaking two years.